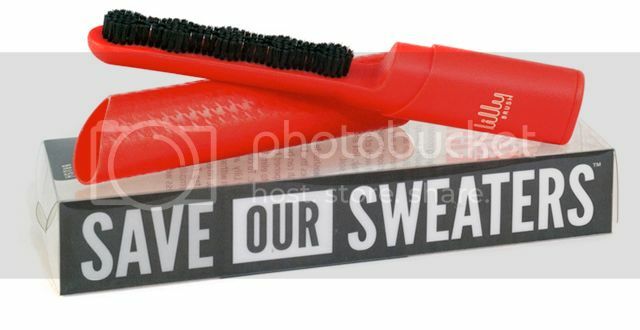 Pammy Blogs Beauty: Save Your Sweaters with the Lilly Brush! Save Your Sweaters with the Lilly Brush! Before taking that next pile of sweaters to Goodwill, try a Lilly Brush! I sure wish I did before my last Goodwill drop off. Nothing makes me feel more frumpy than wearing a sweater that has balled up. Don't you just hate sweater pilling! So, as you can imagine, I was quite curious about the Lilly brush. However, I will admit, I was skeptical that it could really make your sweaters look like new. Well, until I put this brush to the test! It really is a simple concept. The Lilly Brush works on all natural fibers like wool, cashmere, and cotton. The nylon bristles of the Lilly Brush grab those sweater balls and take them right off!!! I was literally amazed the first time I used it! So, how does the Lilly Brush work? 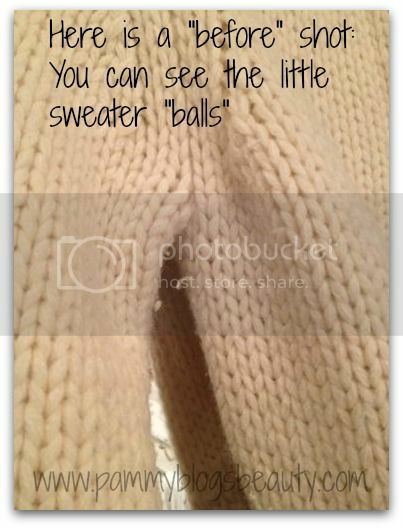 You move the Lilly Brush over the fabric of your sweater and it removes the sweater pills or "balls" by "grabbing" the pills gently in its bristles. There is not pulling nor tugging. You just brush the Lilly Brush over the sweater like you would a tape lint brush. The best way to show ya'll how the brush works is to show you an example! So, lets look at one of my sweaters. You can see a "before" shot here of a sweater that I de-balled with the Lilly Brush. The sweater was just covered with those little sweater pills or "balls". It is super easy! Just whip out your Lilly Brush and gently brush the fabric of the sweater. I found that using quick strokes while angling the brush into the sweater at a slight slant worked best. 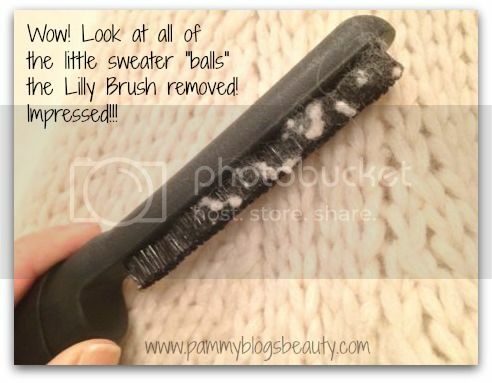 It only takes a few minutes to load up the Lilly Brush with sweater balls! Comparision: Type of Sweater and pilling seems to matter! I found when using across a variety of sweaters that the Lilly Brush is most effect at removing balls from larger knit sweaters with well formed pill-balls. Some sweaters "pill" by becoming fuzzy all over (rather than forming true "balls"...does this make sense). The Lilly Brush was not as effective on the fuzz-pill types of sweaters. I am thrilled with my Lilly Brush and plan to keep one at-the-ready in our front hall closet. A few quick strokes of the Lilly Brush can have my sweaters looking fresh right before I head out the door. I have cleaned up no less than 5 sweaters already! To think of all of the pilled-up sweaters that I have given away, le sigh!